"We're going to roast a cut of beef, the tri-tip, that many have grilled during the summer. It works so perfectly for this, and it's a very nice size for a dinner party. You can let the uncooked roast age overnight in the refrigerator if you like. The meat is so tender and juicy that you simply have to give it a try." Place garlic and 1 pinch kosher salt into a mortar and pestle; grind garlic until it forms a paste. Mix olive oil into garlic. Place roast into a baking dish. Brush garlic paste on one side of the roast. Season generously with 1 teaspoon kosher salt. Combine peppercorns in a small bowl. Press ground peppercorn mixture generously onto roast. Flip meat and repeat, brushing with garlic paste and seasoning with 1 teaspoon kosher salt and peppercorn mixture. If desired, place roast on a rack over baking dish and refrigerate uncovered overnight to dry out. The next day, remove and let meat stand 1 hour to reach room temperature. Melt butter in a large ovenproof skillet; turn off heat. Place roast into hot butter and flip to coat both sides. Season with more salt if desired. Roast meat in skillet in the preheated oven for 15 minutes. Remove meat from oven and flip in skillet. Turn oven down to 200 degrees F (95 degrees C). Roast meat until pepper crust is lightly browned and an instant-read meat thermometer, inserted into the center of the roast, reads 130 degrees F (54 degrees C), about 15 more minutes. Transfer roast to a platter and tent loosely with aluminum foil. Let roast stand at least 15 minutes. Place skillet with pan drippings over medium heat; whisk in flour until smooth. Cook, whisking constantly, for 2 minutes to remove raw taste from flour. Whisk in veal stock. Turn heat to medium-high, bring sauce to a boil, and reduce heat to medium-low. Simmer pan sauce, stirring constantly, until reduced by half and sauce has slightly thickened, about 10 minutes. Season with salt and 1 pinch of cayenne pepper. Stir balsamic vinegar and any accumulated juices from meat platter into pan sauce. Carve beef across the grain, starting at the smallest corner of the roast. Serve slices on warmed plates drizzled with pan sauce. 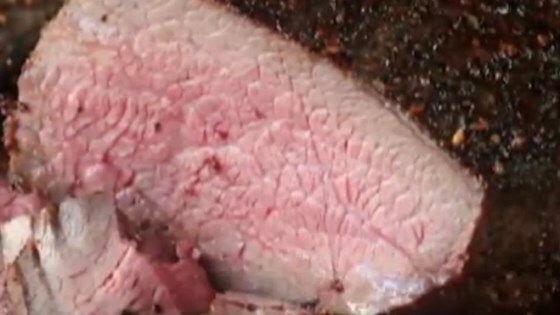 See how to make juicy, pepper-crusted tri-tip roast beef. For stock, you can use beef, veal, chicken, or my favorite, oxtail stock. Most fancy grocery stores will sell frozen veal stock or demi-glace (reduced-by-half veal stock), which is great for special-occasion sauces like this. This turned out much better than I expected. Very tender. Used the gravy over white rice, also very good.